…are still incredibly hot! It was pushing 100 degrees as we sat at our lemonade stand. Which, I suppose, is good weather to have a lemonade stand in… either way, it was a much more preferable event than my trial and errors of making the stand itself! So I wanted to share my experience with you with the hope that you might have an easier go of it. It all started when I read to our little guy about a lemonade stand in one of his books. We talked about it a bit and he (okay, we) got really excited about the idea! We talked about how it would work and flavorings we would make, and when he asked, I told him I would see if we could make it work. First, I asked our landlord if it was even okay, then set to planning. I’m not going to lie; my first plan failed miserably. It wouldn’t even stand up. So I’d like to tell you what not to do and then what worked for us. 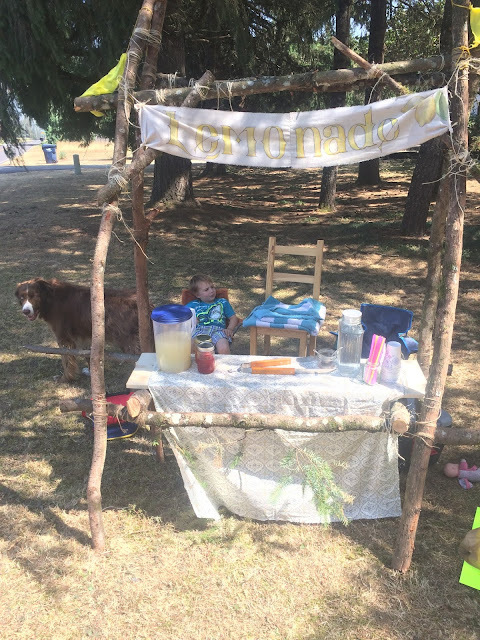 So, if you read my post about our fort (here) you’ll recall we have a ton of fresh, strong branches from a recent tree trimming and I thought they might make a cute, rustic sort of lemonade stand, too. Josh insisted that lashing the round logs was the best way to secure them, but he showed me the right way to do that this time. I’ll pass along that bit of knowledge in a bit, but first I’ll explain my failed design: four upright posts, two braces on each side and a couple angled supports. In the end, I had to back track and take several pieces off to make it a sort of A-frame. Another gem Josh taught through this experience is that triangles are sturdier than squares/rectangles. MUCH sturdier, though it still sits at a bit of an angle on our uneven ground. But, it worked fine and I still like how it looks. So here’s the bit about lashing that I found very helpful and hope to use again in the future: I started laying the branches (each about 6 feet long with a 3 inch diameter) out the front on our patio (propping them up on paint cans made for some extra elbow room) and lashing the cross beams to the uprights. So, we started with a clove hitch. The best way I can describe that is to wrap your twine around one branch twice so they cross with a long tail. Where the twine crosses, slip the tail under both sides and pull tight. Easy peasy. For the long beams across the front, we did square lashings, meaning I would go up and over the branch on top, down under the branch on bottom, then over the top on again on the other side. Basically going around instead of cross. Hopefully the photo can explain what I can’t with words. I followed this pattern about five times over. To add strength, I was advised to keep the twine as neat and snug as possible. I’m afraid I didn’t achieve either to the degree I would have liked, but each one was better than its predecessor. When the five times over-under-over-under pattern is complete, it can be tightened even more by doing the opposite: over the bottom, under the top. About five times around again. This takes up much less twine each round because you’re only circling around the first batch to tighten them in together. Again, I’ll have to refer you to the photo. Once you’ve tightened the lashing, complete with another clove hitch and there you have it! I did a slightly different pattern for the shorter braces going front to back. The only difference is that after the starting clove hitch, I did a cross over back and forth so that they will support the board, still finishing with the tightening portion and ending in another clove hitch. Then lash the tops together in the same way and you’re done with the frame! · Lots of twine! I used about half a skein. Total cost: $12 –but this was only because we had to buy that silly board and twine new. Do you have something already laying around your house that would work? Maybe you could make it for even less! I was looking at lemonade stands online and all I found were well over $100. Very well constructed all and would probably last forever, but I didn’t feel like we needed that. I hope this helps you create your own stand at some point, even if you’re on a budget (be it time or money) and can save you a headache or two! Coming up on Tuesday: an amazingly simple lemonade recipe that tastes amazingly good! I’ll even throw in a couple flavoring syrup recipes, too! Stay tuned! In need of more inspiration for simple lemonade booths? Check out an adorable pallet one﻿ here, or this sweet one made of painted cardboard!